Our preface consists of an apology to you, and of thanks to friends. The book, except the first chapter and the last, is simply a Diary written as we journeyed. It is a round unvarnish'd tale, and we hope that its truthfulness may compensate for its defects. We know that it has many literary mistakes. You will attribute them all to the circumstances under which it was written, and to the fact that the writer, living a thousand miles away from the printer, had no sufficient opportunities to correct the proofs. The illustrations are mainly from photographs and on this account may be considered of special interest. 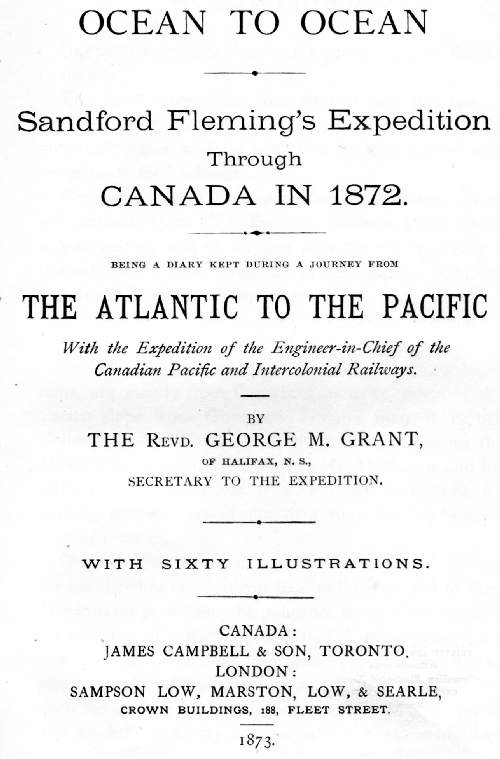 Our maps of the country, east of the Rocky Mountains, are mainly from Captain Palliser's; those of the Pacific slope from Governor Trutch's map of British Columbia. 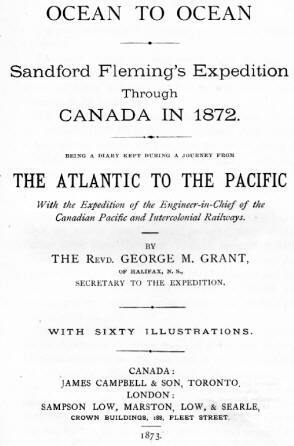 For a number of the plates illustrating the Dawson route we are indebted to Mr. Desbarats and his artists; to the latter and to a kind lady in Ottawa, for making pictures out of our own rude but, we believe, faithful outlines. 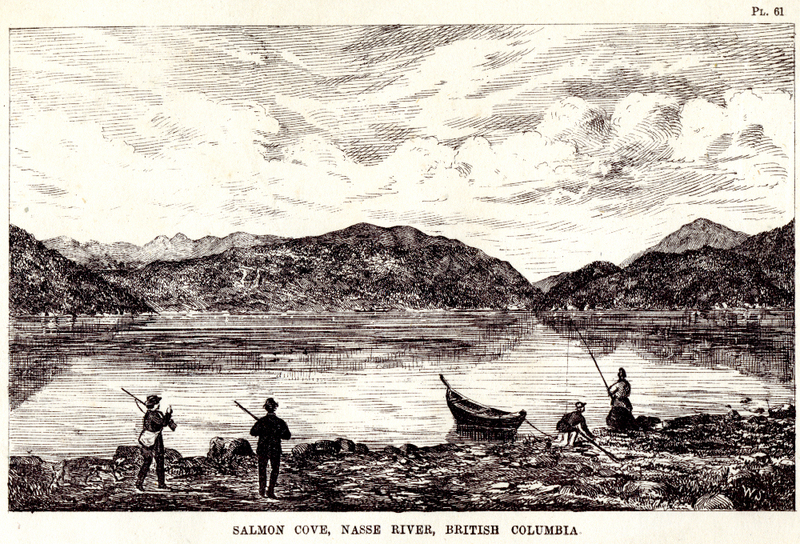 Our best thanks are due to Professor Daniel Wilson for his sketches of Nepigon Bay and River, and to Mrs. Hopkins for permitting the publisher to copy her wonderful painting of "Running a Rapid;" unfortunately, the beauty of the picture has been marred in reducing it to so small a scale. Finally, we thank those who made the sketches of Bute Inlet and the Hamathco River; and all and sundry who kindly assisted us in one way or another. The Chief,........Sandford Fleming, C. E., Ottawa. The Doctor,.......Arthur Moren, M. D., Halifax. The Botanist, ......John Macoun, M. A., Belleville. The Photographer, etc., . Charles Horetzky, ex-H. B. Officer. Frank,...........Son of the Chief, (a lad of 16). Terry, the Cook,.....(Sergeant) Terrance McWilliams. The Secretary, ...... Rev. Geo. M. Grant, Halifax. Adjutant-General. Hugh, son of Col. Robertson Ross, (a lad of 16). Mr. McDougal, (from Fort Garry to Edmonton), Superintendent of Wesleyan Missions on the Saskatchewan. Mr. King, (from Carlton to Edmonton), Hudson Bay Co. Officer. Mr. Adams, (from Edmonton to St. Ann's), Hudson Bay Co. Officer.